This month marks the 50th anniversary of the first Automated Teller Machine. According to the ATM Industry Association, the first ATM in the world was installed at a Barclays Bank branch in London on June 27, 1967. The first ATM in the United States was installed two years later at a Chemical Bank branch in Long island, New York. For 30 years ATMs remained off-limits to blind people, who couldn’t independently use the interactive (and silent) visual screens. 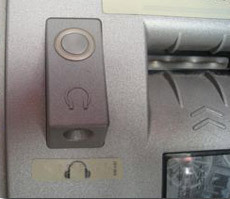 It was not until October of 1997 that the world was introduced to the very first Talking ATM. The ATM’s anniversary is a good reminder that today, all technology should be born accessible. In October of 1997, the first Talking ATM was installed by the Royal Bank of Canada in Ottawa, Ontario. That installation happened because blind Canadian activists Chris and Marie Stark had filed a complaint with the Canadian Human Rights Commission that was resolved in their favor. On June 23, 1999 Well Fargo announced the first Talking ATM plan in the United States. That plan happened because the California Council of the Blind, individual blind customers, Wells Fargo, and ATM manufacturers had worked in Structured Negotiation to develop early Talking ATMs. Linda Dardarian and I had the privilege of representing the blind community. And six months before Wells Fargo’s announcement, on October 1, 1999, a Talking ATM was installed in San Francisco City Hall by the San Francisco Federal Credit Union. It was the first Talking ATM in the United States. That installation happened because San Francisco activists wanted a renovated City Hall to be 100% accessible, and insisted that a Talking ATM be part of that. The following year, in 2000, Wells Fargo began what became a national roll-out of Talking ATMs, as did Bank of America and Citibank. All three as a result of collaboration with blind banking customers through a new dispute resolution process later named Structured Negotiation. Advocates around the country began demanding their right to Talking ATMs so they could bank privately, confidentially and securely. Structured Negotiation proved successful with financial institutions across the United States. Other advocates began filing lawsuits which also resulted in accessible ATMs. Yes. Talking ATMs exist because of advocacy efforts of blind people and their organizations. The 50th anniversary of ATMs is a perfect opportunity to redouble our efforts to make all technology accessible. Blind people had to wait 30 years before a single ATM in the whole world was available to them. 30 years of not being able to access your own money. 30 years of risking financial privacy by being forced to ask for help at the ATM. When ATMs were first introduced in the late 1960’s, there was no Americans with Disabilities Act and no Convention on the Rights of People with Disabilities (CRPD). Disability civil rights laws were almost non-existent anywhere in the world. Today, 27 years after the ADA, when 160 countries have ratified the CRPD, the need for accessibility is not an untested idea. Today, technology developers must make sure all technology is “born accessible.” In 2017 we know better than to design products and services that are not available to everyone — but we all know it still happens. Mobile apps aren’t tested by blind users, videos don’t have captions, websites can’t be operated without a mouse. Talking ATM advocacy was a rousing success beginning in the late 1990’s continuing today around the globe. Advocacy for accessible technology will continue until the idea of offering technology that doesn’t work for everyone will seem as outdated as building a new building with steps as the only means of entry. Or building an ATM that doesn’t talk. Curious about how the blind community convinced Wells Fargo, Bank of America and Citibank to install some of the country’s first Talking ATMs without filing any lawsuits? I tell those stories and more in my book, Structured Negotiation, A Winning Alternative to Lawsuits. The stories show how blind people participated in the design and development of the first accessible machines, building relationships in Structured Negotiation that continue to this day. The Law Office of Lainey Feingold helped negotiate 20 settlement agreements about Talking ATMs in Structured Negotiation. You can find links to all these agreements on the Talking ATM Settlements Page of this website. The Structured Negotiation process frowns on negative press releases to avoid poisoning the relationships needed for successful negotiations without a lawsuit on file. This core element of Structured Negotiation began with the Talking ATM initiative. All in all, twenty two Talking ATM press releases have been issued as a result of Structured Negotiation. Visit the Talking ATM Press Release Topic page for links to the full releases. The Talking ATM Topic page on this website includes the settlements, press releases, and much more, including news of Talking ATM installations around the globe. You can also search the International issues Topic page for Talking ATM stories from around the world. A search of Talking ATMs on the ATM Marketplace news site returns several articles about Talking ATMs. Thank you to the ATM Industry Association for alerting the world to the ATM’s 50th ATM anniversary, and for including me in its list of ATM Industry Champions for “pioneering work in the history of Talking ATMs.” Thank you to Bernardo Batiz-Lazo, who’s writing a book about the history of ATMs, for first letting me know about the anniversary. This is a post about the first Talking ATMs. The first ATM (that did not talk) was installed in 1967. This month marks the 50th anniversary of that ATM. Talking ATMs did not exist until 30 years later. Blind people advocated for ATMs they could use. The first Talking ATM was in City Hall in San Francisco. Back to top of post.